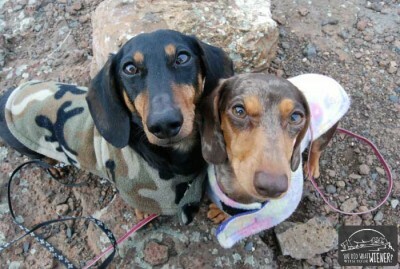 Recently, I had occasion to chat with Jessica Rhae Williams, owner of two beautiful miniature Dachshunds, Chester and Gretel. Jessica writes a very fun blog called, “You Did What With Your Wiener?” You should go check it out. 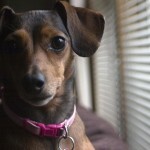 Jessica informed me that a lot of people have misconceptions about the Dachshund breed. 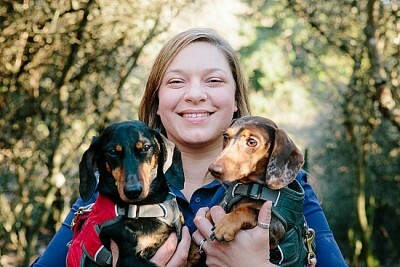 She and her husband often take their dogs on rigorous hikes, and they often get asked if they had to carry their dogs up. No, they didn’t. These small but mighty dogs are tough, and capable of so much more than people realize. I not-so-subtly hinted to Jessica … did she want to write a guest post about Dachshunds, to set the record straight? 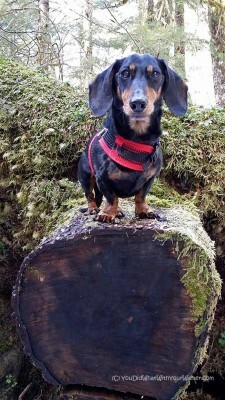 It turns out that she’s a very busy lady, with her own life, but very graciously sent me the following facts that are not commonly known about this breed, the truth about dachshunds they don’t tell you in many descriptions of the dog. Dachshunds are “tenacious”. They were bred to hunt badgers, and other nasty small game, so not backing down is ingrained in them. That means they will try and call the shots around the house and are often seen as stubborn. You usually have to be alert in public with them as they will follow their nose. They may be stubborn but are very smart. They can learn quick but can also unlearn quick. You need to be consistent with routine and commands or they will decide that they want you to do it their way. That being said, there is always some element of “the dog training you” when it comes to Dachshunds. Sometimes you have to just work with their nature. Dachshunds may be small but they have the exercise needs of big dogs (and sometimes more like in the case of a Great Dane). Also, keeping your Dachshund at a healthy weight is very important because extra weight puts undue stress on their backs. Unfortunately, the popular term “sausage dog” perpetuates the belief that Dachshunds should look stuffed like a sausage. Most veterinarians will tell you that at the ideal weight, the abdomen will be tucked and you should be able to see the last rib or two through the skin (much like a greyhound). 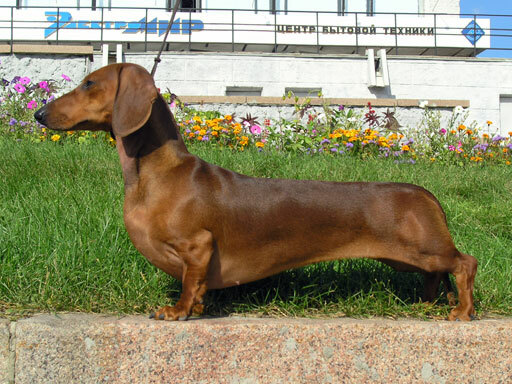 A full-grown standard dachshund averages 16 – 32 lbs (7.3 – 15 kg) while the miniature normally weighs less than 12 lb (5.4 kg). The kaninchen weighs 8 – 11 lbs (3.6 kg – 5.0 kg). 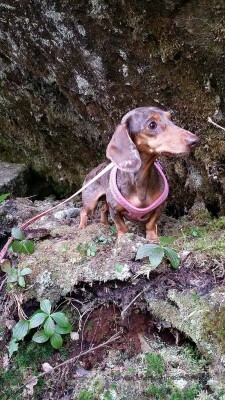 I have been told that anyone thinking about getting a dachshund should do their research first, and talk to other dachshund owners if they can, because the dachshund may be more of a handful than one might realize. 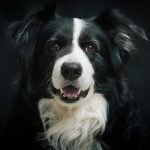 Their propensity towards stubbornness often gets them into trouble with owners who don’t understand the breed, and later decide the dog is too much for them. 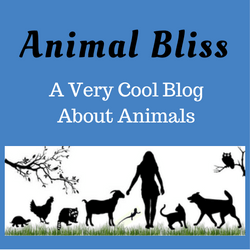 Many thanks to Jessica Rhea Williams, owner of You Did What With Your Wiener?, an active and outdoor lifestyle blog that focuses on enjoying those things with your dog. What other dog breeds would you like to learn about? Leave a comment below? Interesting post! I learned a few things about Doxies I didn’t know. It’s great to see awareness being created for different breeds. They certainly are tenacious! My mother-in-law has a Doxie, Toffee, that outlasts the other dogs in the pack on their 8km walk every morning on the farm. She’s also the best watch dog. It’s her that riles up the others when there’s something to bark at. AND, she’s the only one clever enough to figure out she can get inside the house by jumping through open windows. I’ve been hearing so much fun stuff about Doxies, lately, I just had to share. Isn’t it crazy that those little legs can hike so far? I was amazed at that fact. 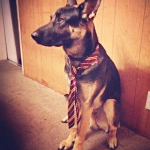 I love your site and your article about German Shepherds. 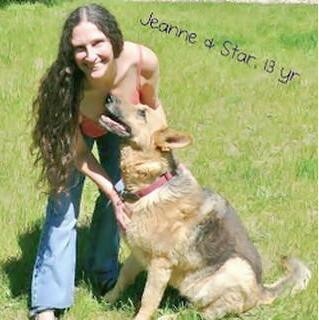 I just lost my Star about a year and a half ago to bone cancer. She was 14 years old and I miss her so. She was my running and hiking partner. I’d get another Shepherd in a minute if I was in a position to. They’re my all-time favorite. Really interesting reading and getting in put on these kind of dogs. Would like to continue getting veiw point from others. Thank you everyone that has posted!!!! thank you for the enjoyable clip on both your dogs and the breed..I personally have have had mini’s sence i was 17 years old and now still have 2 at age 64, one just being a puppy..I agree that they try your patience, but once the meeting of the minds has been established, they are faithful loving dogs..I appreciate the insight of walking, i have often wondered if i walk mine too long, as we all walk about a mile daily..good to know that i am not hurting legs or joints by having them join me in my trail walks.. 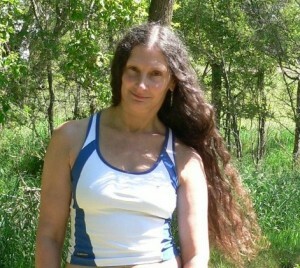 Thank you for visiting my blog today, Liz. Nice to have you hear. I’m glad you enjoyed the post about the Dachshunds. You certainly are a lover of that breed, aren’t you? It’s good that you walk your dog so much, and no, it won’t hurt them. 🙂 All the best! Great article!! I’m going to share it. So many see the super cute puppies and don’t think to research. My opinion is they shouldn’t be for a first time dog owner. Kaninchen are not recognized in the US. They are the 8 lbs or less group. MIniatures are 9-11lbs. Standards are 16-32lbs. In the US we have an unrecognized group affectionately called “Tweenies.” 12-15 lbs. I might also add that Dachshunds generally respond best to positive training. The old school tactics can have disasterous results. My Seeley loves to go with everywhere, loves kids and most other dogs!! He doesn’t like larger breed puppies in his face or super intense dogs. LOVE this breed! Hey, thanks for stopping by, Jennifer. I’ve learned so much about Dachshunds just lately. I’ve never known one personally before. They really are sweet little dogs. I’ve never heard of “Tweenies” either, of course. They all sound like so much fun! Take care, and come back soon! Great post. 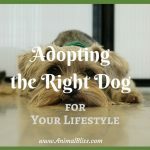 As with any breed, assumptions are not facts and anyone who wants a dog who fits well into their lifestyle should do some research. As always, wise and accurate words from Jessica. I have 3 Dachshunds in my home; two are long term fosters, one is mine, and I lost one to IVDD. Angel, who does not live up to her name, has been seen trotting down the road after digging under the fence which is lined with cement block. She then trots back to return through the same hole. Said hole is now filled but I don’t put anything past her. She is a HUNTRESS. Her “brother,” Luna, is a very small Doxie whose mission in life is to occupy as many laps as possible after exploring the fenced in acreage which Angel finds “too small.” and YESH, most dogs should be more lean than they are because we think they should have some fat – not so and I live mostly with Beagles, the chow hounds of the ages. 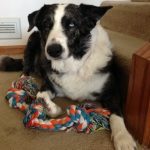 Keep your dogs lean and fit – they will live longer and be more healthy…just as you will be! Thank you for hosting Jessica Rhae. Many people think dachshunds are unfriendly and snappy towards kids and strangers. But they are just like any other animal if it stays at home and never meets or plays with other dogs or people. My long haired Doxie has gone to work with me every day for fifteen years, and at the school and in my classes he meets hundreds every day- and he is always friendly and affectionate. He has also traveled with me to 7 countries; always well behaved on the airplane.